National Institute of Standards and Technology postdoctoral researcher Alex Smolyanitsky developed software to quantify the friction found on graphene. 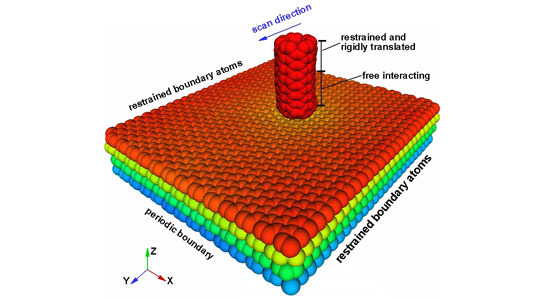 The software is able to show friction at an atomic level by simulating atomic force microscopy. Similar to the way pavement, softened by a hot sun, will slow down a car, graphene—a one-atom-thick sheet of carbon with wondrous properties—slows down an object sliding across its surface. But stack the sheets and graphene gets more slippery, say theorists at the National Institute of Standards and Technology (NIST), who developed new software to quantify the material’s friction. With the capacity to be folded, rolled or stacked, graphene is super-strong and has unusual electronic and optical properties. The material might be used in applications ranging from electronic circuits to solar cells to “greasing” moving parts in nanoscale devices. Be the first to comment on "Modeling Program to Measure the Friction of Graphene"